Margaret K. McElderry Books, 9781442427266, 240pp. In the National Book Award–winning Goblin Secrets, a boy joins a theatrical troupe of goblins to find his missing brother. In the town of Zombay, there is a witch named Graba who has clockwork chicken legs and moves her house around—much like the fairy tale figure of Baba Yaga. Graba takes in stray children, and Rownie is the youngest boy in her household. Rownie’s only real relative is his older brother Rowan, who is an actor. But acting is outlawed in Zombay, and Rowan has disappeared. Desperate to find him, Rownie joins up with a troupe of goblins who skirt the law to put on plays. But their plays are not only for entertainment, and the masks they use are for more than make-believe. The goblins also want to find Rowan—because Rowan might be the only person who can save the town from being flooded by a mighty river. This accessible, atmospheric fantasy takes a gentle look at love, loss, and family while delivering a fast-paced adventure that is sure to satisfy. 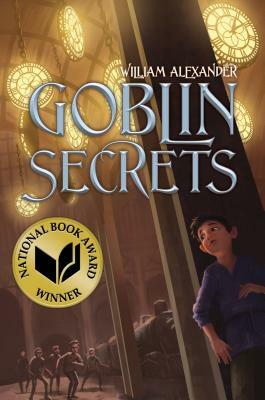 William Alexander won the National Book Award for his debut novel, Goblin Secrets, and won the Earphones Award for his narration of the audiobook. His other novels include A Festival of Ghosts, A Properly Unhaunted Place, Ghoulish Song, Nomad, and Ambassador. William studied theater and folklore at Oberlin College, English at the University of Vermont, and creative writing at the Clarion workshop. He teaches in the Vermont College of Fine Arts MFA program in Writing for Children and Young Adults. Like the protagonist of Nomad and Ambassador, William is the son of a Latino immigrant to the US. Visit him online at WillAlex.net and GoblinSecrets.com, and on Twitter via @WillieAlex. "William Alexander organizes his atmospheric first novel into acts and scenes, rather than chapters, and he couches it in the beautifully elliptical language of the old fairy tales."